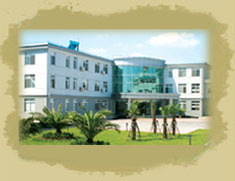 Located in the southern suburb of Shangai,built up on 22,000 square meters of land,with more than 600 employees, Shanghai GoldTex Clothing & Bags Co.Ltd. 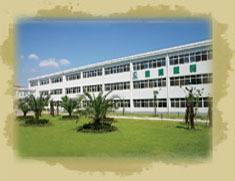 has been a leading manufacturer and exporter of horse riding products and outdoor clothing in China since 1995. Specialized in manufacturing waterproof,windproof and breathable PU-coated and seam-taped clothing which is ideal for outdoor activities, we provide a wide range of products including riding apparel,horse rugs, sheets and blankets,and saddle pads.Our products have been well accepted by clients around the world for up-to-date style,top quality,competitive price,punctual delivery and excellent customer service.We not only manufacture according to designs as provided by customers as well as secure their designs,but also creatively and continuously generate our own designs for our customers to keep pace with current trends in Europe and North America. 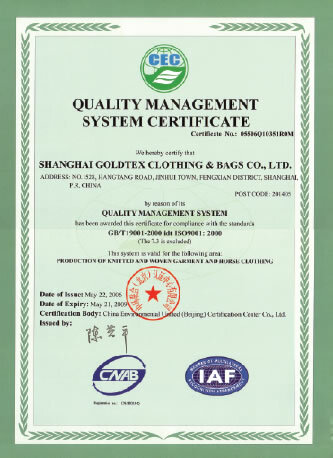 Being awarded the "Quality management system certificate" for compliance with standard ISO9001:2000,we have been always placing customer satisfaction at our top priority through a series of measures to ensure the highest quality.We use only the finest fabric products such as microfiber,cotton,nylon and polyester or blended either imported or locally made.Also,all the fabrics and accessories such as zippers and press-studs must go through stringent testing before they are used in our production.During the production all the garments must be checked piece by piece under strict on-site and final quality control. In addition,we devote ourselves to developing pleasant working conditions and social welfare systems for our employees.We have passed the VF WARANGLER Survey and have had stable long term cooperation with many world-famous brands. If you need a reliable supplier for a long-term business relationship in China,you are in the right place!We appreciate your interest in our company.Your inquiry and orders will receive our utmost attention and care. 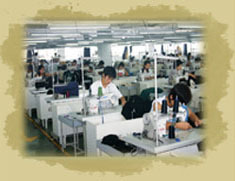 Copyright (c) 2001 Shanghai Goldtex Clothing & Bags Co., Ltd. Factory Tel:86-21-51083900 Fax:86-21-57580038 Address:No.1528 Hang Tang Road,Feng Xian District,Shanghai 201405,China.